On the afternoon of October 5, 1954, hurricane hunter planes found the eye of Hurricane Hazel about 50 miles east of the island of Grenada. The eye was poorly defined, but its highest winds were already near 100 mph. It was the beginning of a storm that was to spread death and destruction from the Caribbean up through the Carolinas, the middle of the Atlantic states and into Canada. As Hazel crossed the island of Haiti, it left a death toll that was estimated as high as 1,000 people. By October 14, Hazel's winds accelerated to 150 mph, and the storm was moving at an incredible forward speed of 30 mph. Hazel then moved through the Bahama's, leaving six dead. 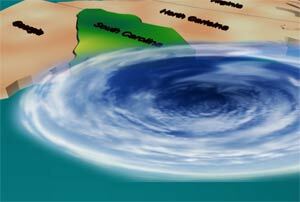 By 11:00 a.m. on October 14, Hazel reached North Carolina, its winds sustained at 150 mph. It was preceded by a storm surge of 14.5 feet. When it reached Garden City, South Carolina, it destroyed the entire town, leaving only two of 275 homes habitable. Hurricane Hazel, which moved in on the North Carolina Coast Friday morning, continued to move northward and to accelerate during the day, and by 9:00 p.m. was centred between Buffalo and Rochester. The intensity of this storm has decreased to the point where it should no longer be classified as a hurricane. This weakening storm will continue northward, passing east of Toronto before midnight. The main rainfall associated with it should end shortly thereafter, with occasional light rain occurring throughout the night. Winds will increase slightly to 45 to 50 mph (72 - 80 km/h) until midnight, then slowly decrease throughout the remainder of the night. For Lake Ontario and Niagara Regions, Toronto and Hamilton cities: Rain tonight. Cloudy, with occasional showers Saturday. Little change in temperature. Winds north 40 to 50 mph (64 - 80 km/h) this evening, decreasing overnight to northwest 30 mph on Saturday. Low tonight and high Saturday at Toronto, St. Catherines, and Hamilton, 45 and 55 degrees fahrenheit (7 and 13° C). Outlook for Sunday, cloudy and cool. There are varying opinions on whether or not the forecasts were accurate or given in sufficient time. It is clear, however, that if more people had taken the warnings seriously, lives would have been saved and damage to property would have been less severe.